Rep. Jason Bedrick talks with fellow New Hampshire legislators. A 24-year old Orthodox lawmaker makes history. Introduction by Shira Schoenberg courtesy of the Concord Monitor. Exclusive Interview by Ben Burrows. When Jason Bedrick was considering a run for state representative, an incumbent legislator encouraged him to shave his beard. Bedrick refused. "I said the beard is off-limits, and that's not the half of it," Bedrick said. Bedrick, an Orthodox Jew, said he wouldn't enter churches. He wouldn't campaign at the transfer station on Saturdays. And he wouldn't shake hands with women. His friend said he didn't know how Bedrick could win. "To not shake hands with half your constituents, that qualifies me as a disabled politician," Bedrick said. In 2006, Bedrick, a Windham Republican, eked out a six-vote victory to become the first Orthodox Jew elected to the New Hampshire State House. 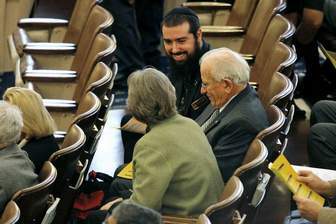 Since then, Bedrick, 24, with his beard and a black velvet yarmulke, or skull cap, has established himself as a studious and often quiet conservative legislator with an interest in education. He still won't shake hands with women or work on Saturdays. And he has welcomed his role as unofficial Jewish ambassador. "The Jewish faith has outward signs of being Jewish to improve your behavior," Bedrick said. "If I walk in with a beard and yarmulke, I represent something. . . . I need to constantly study to know what I'm talking about, to avoid foul language, gossip, negative talk about people. You have to always be on your best behavior to make sure you're a good and proper representative of your faith." Bedrick grew up secular, a fourth-generation New Hampshire resident. His great-grandfather came from Russia and settled in Nashua, where Bedrick's father, Mark, had his bar mitzvah at a Conservative synagogue. Bedrick's mother was Catholic and converted to Judaism. The family celebrated both Hanukkah and Christmas. Jason Bedrick said that one year he decided to fast on Yom Kippur, the holiest day of the Jewish calendar, and his mother brought home food from McDonald's. Bedrick's parents taught their three sons about Jewish history and culture, but they kept no religious rituals. "We taught our children basically a belief in the Ten Commandments, to respect all people and all religions and all religious beliefs, and even if the person didn't have religious beliefs, you respect everyone as an individual," Mark Bedrick said. Bedrick attended public school for eight years, then switched to Bishop Guertin, a Catholic high school in Nashua, believing that the education was better. Attending Catholic school forced Bedrick to confront his own faith. He taught himself Hebrew. He surfed the internet, trying to learn about all religions. He started an interfaith club. And he won a religious studies award for "the student who best understands the Christian message presented in the classroom." "In conversation with anybody, even some of the Catholic priests, he would know more on a subject than they would," Mark Bedrick said. "Because he was an avid reader, if there was something he didn't know, he would research it and read about it, from a lot of different perspectives." But it was at Babson College, a Massachusetts business school, that Bedrick's path toward both Orthodox Judaism and political activism was set. Bedrick had long been interested in school choice, supporting education vouchers and charter schools. For a college political science class, he wrote a paper about education in New Hampshire. While in college, he ran for state representative as an independent, with little hope of winning, to raise the issue of school choice. Bedrick was also a senior editor for the college newspaper, the Babson Free Press. It was that position that led him to Rabbi Moshe Bleich, director of the Wellesley Weston Chabad House. Bleich is part of Chabad-Lubavitch, an international Orthodox Jewish outreach organization the promotes Judaism to Jews of all levels of religious observance. Bleich and his wife invite local college students to Jewish programs, classes and Sabbath meals in their home. Bleich sought out Bedrick after seeing a pro-Israel article Bedrick had written for the newspaper. "I invited him for Shabbat dinner because of the article," Bleich said. "I wanted to meet him, and one thing led to another." Bedrick grew close to Bleich's family and started visiting for the Sabbath and holidays. He started reading about Judaism and asking Bleich questions. "He really put the pedal to the metal when it came to studying. He was obviously searching for something," Bleich said. The turning point in Bedrick's observance was when he took a trip to Israel with other college students. Bedrick decided that while in Israel, he would wear a yarmulke. He saw his tour guide wearing tzitzit, a ritual garment with fringes that Orthodox men wear under their shirt. "I thought it was an amazing concept, this garment my people have been wearing for years, to remind you to keep the commandments," Bedrick said. So he bought a pair. On the plane ride home, Bedrick began to reconsider his intentions to remove the yarmulke and tzitzit. "I thought, 'I'm Jewish in Israel, but not America?' This is my identity." He kept the clothing and became one of two Babson College students to wear a yarmulke, Bleich said. Bedrick had already given up eating pork and shellfish, and now he started adhering more fully to the kosher dietary laws. He did not eat milk and meat at the same meal. He started walking to the rabbi's house on Friday night, since observant Jews do not drive on the Sabbath. After college, he returned to Israel for the summer. His observance even surprised his rabbi. At the time, Bleich said, Bedrick's ambitions of public office and his religious observance were both "pipe dreams." "How many people get elected? How many people become religious?" Bleich said. "It's a very small percentage." After graduation, Bedrick worked in his parents' furniture business for six months, then decided to go to a yeshiva, a religious school, in New York to learn more about Judaism. While Bedrick was studying, a friend in the Legislature called and asked him to run again, this time as a Republican. As a student, with no family to support, Bedrick said, "I know if I was going to do it, this was the time. I figured if I win, great. If I lose, I go back to yeshiva." Bedrick returned to New Hampshire in August, facing a September primary. As a newly observant Jew, he found himself back in a state that has two Chabad centers and no other year-round Orthodox synagogue. There are about 10,000 Jews in the state, according to national Jewish organizations. But just "a handful of families" are Orthodox, said Rabbi Levi Krinsky, director of a Manchester Chabad center. The most challenging law during the campaign was that prohibiting contact between unmarried men and women. "You already look weird because it's not common to have beards, then you say I'd like you to vote for me but I can't shake your hand," Bedrick said. He learned to knock on doors with his hands full, and when a woman extended her hand, he handed her a pamphlet. When members of the Salem Women's Club were offended by the practice, he sent the club an e-mail explaining his religious principles. He stressed that Judaism sees men and women as equals, and the laws were out of respect. "I can compromise of policy but not on principles," Bedrick told them. The president of the club started campaigning for him. Bedrick won the primary by 19 votes. In the general election, he finished 13th out of 17 candidates, making the cut between the winners and the losers by six votes. Since coming to Concord, Bedrick has had to explain the restrictions again to fellow legislators. "If I haven't seen him in awhile, I can't give him a hug because he's not allowed to," said Rep. Marilinda Garcia, a Salem Republican. "I'm Italian, so that's a big thing for me." Bedrick sits in front of her, and she has to remember not to poke him to get his attention. But Garcia said she understands. "It's somewhat obvious that he's strictly religious, so he'd explain that it's a religious practice and it's fine. . . . I admire the discipline." Bedrick also faces other challenges. A lot of State House business is done in the dining room, the Barley House, or Capitol Grille - none of which serve kosher food. Bedrick has started walking into restaurants with a bright red lunch bag. "It's intentional, so it's obvious that I'm not eating their food," he said. Waiters and colleagues have been understanding, he said. With no synagogue in Windham, Bedrick generally leaves for the Sabbath, and stays overnight at the Chabad house in Wellesley, Mass. He sometimes attends prayers and classes at the Chabad in Manchester. When the Legislature is not in session, he studies at a religious school in New Jersey. State Rep. Bob Elliott, a Salem Republican and retired Methodist minister, said Bedrick invited him to a family Sabbath dinner. The two often discuss theology. "The biggest difference is in how we look at the historical figure of Jesus, but some of his practices are the origin of some of the beliefs in the Christian faith," Elliott said. Elliott, 76, said Bedrick is the first Orthodox Jew he has ever had both a friendship and working relationship with. "All it's done is to increase my admiration," Elliott said. "To live out his faith requires a great deal of motivation, faith and discipline. . . . He's a role model for people to admire, even if they're not of the Jewish faith." Bedrick does not deny that his religious views affect his politics. "A person's politics expresses their deeply held beliefs, and a person's religion is a deeply held belief," he said. "I won't ban pork, but has it affected my views on justice and fairness? I believe it has." One bill Bedrick sponsored relates to a law that only an "ordained minister of the gospel" or "non-ordained clergy" can perform marriages. A statute had singled out rabbis and Quakers as an exception, allowing them to perform marriages, and Bedrick's bill would expand that exception to all faiths. But his opinions are not limited to religious issues. He advocates limited government. He endorsed Mike Huckabee, an evangelical Christian, in the presidential primary, citing Huckabee's emphasis on a "culture of life," his free-market ideas, his willingness to take on health care and education, and his executive experience. Bedrick's main issue remains school choice, and he sponsored a bill that would allow high school seniors to spend a year at a community college. Bedrick does not plan to run for another term. Instead, he will spend another year at a religious school while applying to law school. While he enjoys politics, he ultimately needs to earn a living, he said. What does Bedrick think about his legacy as the only Orthodox Jew to serve in the Legislature? "It's an interesting historic footnote," he said. But he pointed out that other non-Orthodox Jews have served. "A Jew is a Jew," he said. "If you're Jewish, you're as Jewish as Moses." PJV: I understand that you are a Republican, and that you're conservative and that you're an Orthodox Jewish legislator, but not completely doctrinaire. In fact, there apparently has been a disagreement with the NRA about firing range safety. Bedrick: Actually no, the NRA was on our side. There was a local group that totally misinterpreted that bill. That's actually quite a long, complicated story, but in short, there were some people who have been trying to shut down firing ranges by any means necessary. They had tried to use noise ordinances to shut down gun ranges through the courts, but they failed, but they pledged to use environmental regulations to shut down the ranges instead. In response, a number of different groups came together… a wildlife group, an environmentalist group, some of the different firing ranges and some of the different gun groups and we tried to work out a compromise that said...ultimately, that if any firing range was doing damage to the environment, that they could be shut down temporarily, in order to clean up the problem, but that the regulations couldn't be used as a pretext to shut them down permanently. So that was something that actually, the local environmental groups and the local gun groups all supported, except for one and they said we were on a “crusade” to shut down firing ranges, which is the complete opposite from the intent of the bill, which was both to protect the environment and to protect the firing ranges. PJV: Sounds like a perfectly good Jewish position, to try and find a good compromise and negotiate with whomever happens to be in conflict. Bedrick: Yes. Well, that's what we tried to do and actually the NRA was happy with the bill. They thought it protected their interests and was reasonable. It was only one group, The Firearms Coalition, which had broken away from Gun Owners of New Hampshire years ago, because of their...let's just say, because of their bombastic, fiery tactics, and they were the only ones who were upset. But that legislation will probably come back in a different form next year. PJV: Have there been any conflicts in your legislature about pro-life and pro-choice positions that you've been involved with? Bedrick: There have been bills that have come to the floor that have been dealing with those issues, but none that I've really been involved with as I didn't co-sponsor any of that legislation and none of it came before my committee. I sit on the Labor Committee, so I mostly deal with labor unions issues and workplace safety issues and things like that. The only one that I've co-sponsored with other legislators was the Parental Notification bill. We had a Parental Notification law, years ago, that the local courts had struck down. It went to the Supreme Court which said that the law only had one section that was unconstitutional, but that the concept of the law was constitutional. Last year, the Legislature repealed the parental notification law and the majority said it was because it was unconstitutional. So we sponsored a parental notification law that was based on the language that the Supreme Court had upheld in other decisions, in other states. Apparently, the unconstitutional argument was just a pretext because the Democrats killed the bill anyway, even though it did exactly what they said they wanted it to do, which was to provide a health exception. Unfortunately, that legislation failed this year, but if the Republicans take back the House, which I think is likely, that legislation, which was very popular in the state, is likely to reappear next year. PJV: Okay. Are there any other issues that you've been involved with that your Judaism has informed your political actions? Bedrick: It's tough to say directly. I mean, I can't think of any issue where I immediately cracked open the Shulchan Arukh to see what the position is that I should take. But I think the general sense of "What is justice? What is fairness?” Those types of issues of course, I think that Judaism does play, I wouldn't say just an indirect role, but it plays an important role. Politics is to a great degree, an expression of one’s deeply held beliefs. This is true for almost any issue, for example, marijuana. There was a debate this year over decriminalizing marijuana – not legalizing it, but decriminalizing it. The current law is that if a person is in possession of any quantity of marijuana, then they face a misdemeanor. Now a misdemeanor in New Hampshire carries up to one year in prison and up to a $2000 fine. That may be reasonable if a person is selling to a minor or if the person is smoking and then driving a vehicle, but should an adult in possession of a small quantity of marijuana for personal use face jail time? There was a bill that was offered so that possession of under a quarter of an ounce of marijuana would be a violation, which is up to a $200 fine, instead of prison time. And I believe that something like prison should only be reserved for people who pose a danger to society, to other people. So of course, once a person smokes and gets into a car, they pose a danger to other people. If they bust a party and there's college kids in a basement smoking, I don't think they should be going to a prison for that. I don't think it should be legal, but I don't think they should be going to prison for that. Did my Judaism influence my decision there? Well, it likely affected my general concept of what is fair and what is just. We have a tradition of favoring Hillel over Shammai, of being lenient in certain matters and I think that, to a great extent, my whole worldview is shaped by that tradition. Even though I'm hard-pressed to find any references to deal with the issue of drugs anywhere in the Pentateuch. PJV: I quite understand. Thank you. Orthodoxy is apparently a novelty for the New Hampshire legislature. Do you have any trouble getting kosher food in the cafeteria? Bedrick: There's no kosher food in the cafeteria, besides raw fruits and vegetables...I mean, they've got apples and bananas and oranges, but I'm perfectly capable of packing my lunch. PJV: Are there kosher food restaurants nearby? Bedrick: Not in this state, yet. We do have a few in Boston and thanks to the local Chabad rabbi, there's a supermarket which carries Empire and other Kosher meats (they just dropped Rubashkin). Certain brands of kosher cheeses are also available. They even started bringing in Israeli bread. So, it's possible to purchase kosher food, but not at a restaurant, yet. PJV: Are there synagogues to daven for minyan? Bedrick: There is a Chabad house. They don't have a minyan every day yet. They do for Shabbat and on Sundays, but the community is growing and I'm hoping that within a few years we'll be able to get a regular minyan. It is expanding, they're moving into new facilities hopefully soon we'll have a daily minyan. PJV: Have you had any trouble with legislative scheduling on Shabbat? Bedrick: No, they never schedule any votes on Shabbat. There was once that I had to miss a vote because of Passover. That was not an originally scheduled day, we had gone over time one day, we didn't finish our business, we had to have a special session, which I missed. But, besides that, I have one of the top attendance records. And I'm very fortunate that there are not really any conflicts with Shabbat and Yomim Tovim. PJV: We in Pennsylvania have thought that our legislature was large. With 253 members it is the second largest in the nation, but yours beats us hands down. Bedrick: We have 400 members of the House and we have 24 Senators. So yes, it is by far the largest state legislature in the country. We have 1.3 million people, so it comes out to about...just over 3000 voters to every legislator, so we're by far the most representative government in the country and probably in the English-speaking world. PJV: Do you represent a district within the state or is it an at-large election? Bedrick: It's a district within the state. I represent two towns. We have an interesting system. There are two towns comprising 40,000 people and there are 13 legislators that operate in this district. So each person actually has 13 legislators. PJV: Is that because of the 13 colonies? Bedrick: Heh. No, it's actually because of a state supreme court decision of a few years ago that changed how we districted the state. But there's a constitutional amendment coming up, so that in 2010, it's going to be a lot different. It's going to be mostly single towns. There are some very large districts...I have the largest district with 13 legislators. There are other districts that have as few as three legislators. So it's sort of a strange system the way they've put it together, but it's going to be changing, I think for the better, soon. My district in 2010 is going to be divided into two districts. PJV: Well, it's a fascinating difference in the way state governments work. Have you found allies on both sides of the aisle that you can work with? Bedrick: Oh, absolutely. I would say more than half of the legislation that I co-sponsored had Democrats on it, including all of the most important bills that I filed. I'm happy that my first bill just made it through both the House and the Senate and that was a bill that I co-sponsored with other Republicans and Democrats to divest New Hampshire state assets from any corporations that are doing business with the Sudanese government. I passed the Senate just last week. PJV: How did you find your way into politics? Bedrick: It was when I was in college. I was not really observant then, I think you probably know that. So I was in Babson College and I was never political, growing up. My family was not really into politics, but I became involved in college. After the events of September 11th I became very interested in Middle East politics and Israel. I've always been passionate about Israel, but I started getting involved in Israel action groups and that led me into the whole arena of politics. PJV: What would you say to a young Jew interested in pursuing a political career? How would you tell them to prepare and how would you encourage them to pursue their interests? Bedrick: Well, it depends on what kind of politics they want to get into. But just in general, you need to read the newspapers every day and know which websites are the important websites to follow, things like The Drudge Report, National Review and The New Republic. You really should really try very hard to listen to opinions on the other side. It's far too easy to enter the echo chamber and only listen to those voices with whom you agree. I think that's a very dangerous thing when a person does that. They need to have a healthy appreciation of the other person's point of view. Too often people believe that they're right and that's it, and if you disagree, you are either too dumb to know that they’re right; or that if you're smart, that's even worse, because you have some ulterior motive for not agreeing with them. But there really are, not just two sides, but many, many sides to every issue and about which reasonable, intelligent, well-intentioned people can and will disagree. The Founding Fathers of this country, in their wisdom, realized this and created a system of checks and balances which I think many of us take for granted. The system we have prevents any one person or any one group from taking too much power. Besides I really do appreciate the system and I think that that's what a person has to do is to understand the system and to stay active, stay involved and stay informed. PJV: You mentioned that your committee is one that deals with labor issues. Is that something that you had experience with before you entered the legislature? Bedrick: It was not actually. I had joined the legislature hoping to be on the Education Committee. I have been very passionate about education and about school choice and if not, I wanted to be on the Judiciary Committee because I also have a passion for the law. Unfortunately, as a Freshman in the minority party, I basically got last pick of committees, so I definitely didn't get the committees that I wanted. I was assigned to Labor essentially because I had a degree in business. So, they thought that of the remaining choices, that Labor would be a good spot for me. But I do enjoy the committee very much. There are a lot of wonderful people on the committee. It's been a lot more interesting than I thought it would be. PJV: Do you have any words to friends or relatives in the Philadelphia area? Bedrick: I don't. I had an uncle who used to live in Philly, but now he's in New York, so I don't have any family out there anymore, but it's a wonderful state with a very rich history. PJV: Well, come by and visit sometime. I did some hitchhiking in New Hampshire about 30 years ago and had a wonderful time. I recommend the state highly. Bedrick: Well, it's a wonderful state, the "Live Free or Die" state and still no sales tax, no income tax and just in general a very, very pleasant and wonderful, nice people up here. PJV: I was thinking of titling this "Live Free and Daven". Bedrick: Heh. That's a good one!